Marketing automation is a phrase that pops up often but what does it really mean and how can it be used to improve performance on a day-to-day basis? In a nutshell, marketing automation is a software-based solution for carrying out marketing activity. It springs into action on the back of various pre-programmed events without the need for human action or intervention. Essentially, marketing automation takes the draining man hours out of some elements of your reactive marketing strategy. Automation is most commonly used within email and social media marketing activities. It has given birth to a number of popular marketing management platforms including the likes of HubSpot. Marketing automation is particularly common within the retail sector. If you’re an online shopper, you’ve probably been the subject of marketing automation, as some of the simplest of everyday online experiences are effectively marketing automation at work. An excellent example of successful marketing automation is Amazon, with its highly personalised content providing product suggestions based on items already purchased. A common use for marketing automation is to try and capture shoppers who abandon shopping carts. If a shopper fills their online cart and then leaves your site, automation can be used to trigger a pre-designed email to encourage them to complete the checkout process. In this instance, you’d set your automation software to recognize this event and auto send the drop-out email to any shopper who leaves items in their cart. More sophisticated automations can add the items left in the cart into the body of the email itself to remind potential customers what they’ve left behind. This is a prime example of reactive marketing automation using email. More advanced marketers use email automation on a deeper planning level to create branding narratives in the hope that signups can be converted into sales over time by gradually familiarising them into the brand. Let’s say you have a fantastic blog and you inspire visitors to sign up with their email address to comment or receive blog updates. You can then use email automation programs to deliver a pre-set narrative or series of emails to this new user. Following an immediate welcome email, you can set in motion a sequence of emails sent at regular intervals. These emails progressively explain more about your brand and what you have to offer. This sales or brand awareness narrative can be set to stop if the user returns to your site and makes a purchase but can be replaced with another set of automation more relevant to those who are already customers. 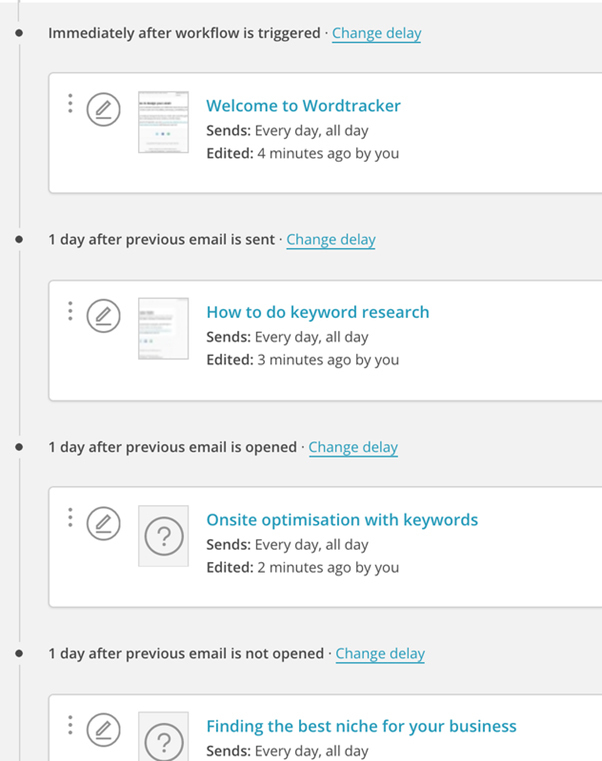 Wordtracker, for example, uses a sequence of emails for people signing up, with information and pointers on how to get the best out of the service. Used in this way, marketing automation provides an excellent means of nurturing the middle of your sales funnel automatically after your automation process is set up. Automation software can help take some of the load off when it comes to the 24/7 open line you have with your social media audience. Many small businesses and personal brand owners and marketers will find themselves stretched extremely thin with day-to-day business and marketing operations but will still need to find time to actively respond to social media interactions. ‘Response Bots’ are a popular type of automation designed to help solve this particular problem. An automation bot can be programed to issue one of a number of pre-programmed responses to common social media queries or in the case of platforms like Twitter, provide a welcome message or follow-back action to new followers. Exploring this example a little further, it is common practice for ecommerce or service brands to include a link to their website within a welcome message or tweet. This is done in the hope of turning fresh new followers into site visitors immediately. Response bots are also commonly used to aid social media customer services teams. They can be set to respond automatically to complaints and queries with key information such as customer service open hours or a message promising that a member of the team will be in touch at the earliest opportunity. This use of automation means messages from customers and potential customers are acknowledged right away, giving a positive impression of the brand. 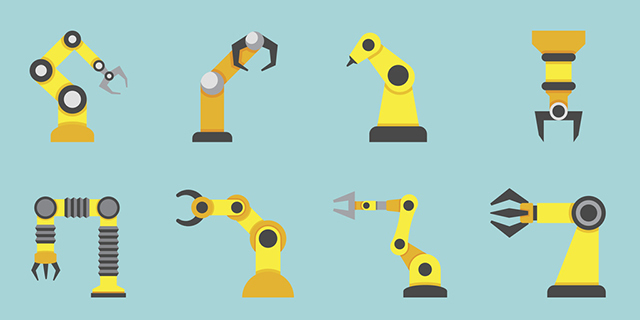 Where does automation fit in my marketing mix? Marketing automation is an excellent prospect nurturing tool and useful for upselling to existing customers. It can also be used to encourage greater loyalty over time and can prove to be an excellent customer service assistant. You can use marketing automation with social media queries and complaints for a quick initial response ahead of providing a more personalized reply. What marketing automation does not do, is any top of the sales funnel activity. This means that automation strategies are based on reacting to visitors and customers you have acquired. It doesn’t generate new leads. Without a sustained influx of new potential customers to your site, automation can play no major part in your ongoing digital marketing efforts. It’s a common misconception that marketing automation can be used to generate new sales. Yes, it can help convert a new customer for the first time but that prospect needs to have been acquired initially by some other means for the automation process to work. Businesses looking for growth and increases in sales should view automation more as a conversion assistant than a new business generator. One thing you should never do is to try and shortcut your marketing process by purchasing email lists to feed your automation process. Not only will this give you a very low quality list you won’t see much benefit from, it is also unethical - subscribers have to actively opt in to email lists, and you may end up being reported for spam mailings. When is the right time to consider automation? Because marketing automation isn’t designed to actually generate leads, it should be considered only when you have a decent sales pipeline and lead generation tactics up and running. Marketing automation is a superb conversion optimization tactic when done right and can be an excellent upselling assistant. With the right program and some well thought out upfront planning, it can also be a hugely cost effective addition to your digital marketing efforts. Put in the relevant time upfront and the right approach to marketing automation could increase the average value of conversions along with the number of conversions made from visitors. It can also be useful for reducing shopping cart abandonment, again helping to better your conversion rates. If you’re already successfully generating cost effective traffic and leads, marketing automation is a valuable tool which can also help reduce time pressures and free up resources.